Various details about the upcoming Xbox One S All Digital Edition seems to have been leaked. 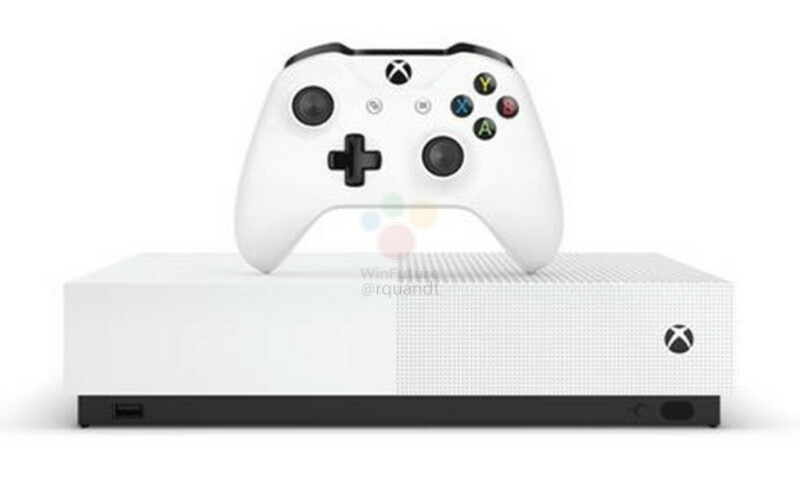 According to an exclusive report from Winfuture, Microsoft is soon going to launch a new Xbox One S All Digital Edition that won’t include an optical drive and will provide a disk free gaming without using data carriers. The post also shared some other details about the Xbox One S All Digital Edition including price, pictures and launch date. Winfuture reports that the Xbox One S All Digital Edition won’t use any disk and will entirely rely on downloads as the only source for gaming. The Xbox One S All Digital Edition will come with three pre-installed games that include, Minecraft, Sea Of Thieves and Forza Horizon 3. However, players will also be able to purchase more games from the Microsoft store if they want. Game Pass users will also be able to download games from an ever-expanding library of over 100 games for free. Look wise, the Xbox One S All Digital Edition appears to be the same as the Xbox One S. The only difference it has is the no option to insert a disk. The disk on the Xbox One S All Digital Edition is of 1TB that’s I think would be quite enough for installing the games. According to the report, Xbox One S All Digital will cost € 229.99 and will come with an only white color option with the wireless controller. The Xbox One S All Digital will be available in Europe from May 7, 2019, and pre-ordered is expected shortly after the first presentation expected on April 16th.